Win Tuneup Pro is the PUP that uses misleading techniques to prevent removal. Use Reimage to locate malicious components and get rid of them faster than with uninstall instructions. A full system scan blocks virus reappearance and prevents traffic to malicious domains. How does the application spread? 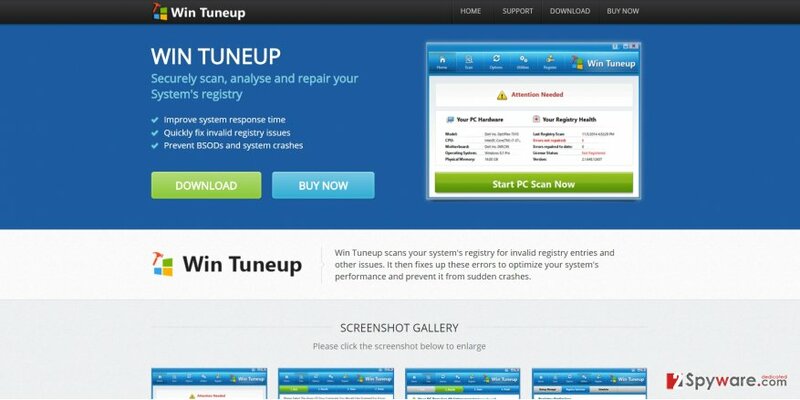 Win Tuneup Pro application appeals to those users who are looking for a way to boost up the PC performance. For example, if you are using a computer with low processing capabilities, the thought that you might artificially enlarge them might cross your mind. Then, it is not surprising if this application has attracted your attention. Nonetheless, we do not recommend installing this application. Though Win Tuneup Pro is not a virus, it is classified as a rogue anti-malware application. Specifically, it claims to fix existent and damaged registry files. As a matter of fact, it displays fake positives to convince users into purchasing the futile edition which would supposedly solve the issues. In fact, it is just another marketing trick . If you are interested in how to remove Win Tuneup Pro, read the following article. Reimage comes in handy. It speeds up the entire Win Tuneup Pro removal. Online advertising companies find new approaches and techniques to entangle users into their artificial reality and make them their customers. While specific marketing tricks work in reality, cyber space requires different appeals and images. Computer security and data protection have been popular topics. Anyone who is considering how to ensure the proper operation of the device might get attracted by the idea to entrust this task to a digital tool. What is more, such thought is reinforced by the lack of time. It might be hard to find a person who spends time on regularly defragmenting local disk. Likewise, taking care of your computer already takes valuable time but at the same you want to enjoy its full capabilities. Therefore, marketers fish for new users who are concerned about their devices. You might download Win Tuneup Pro from its official web page. Usually, such programs are promoted in cyber-security related web pages. Additionally, they might be “bundled” with freeware applications. Likewise, you need to be very careful while installing new applications. Unwanted applications usually are attached under “Recommended” settings. Netizens make the same mistake again by choosing the latter settings and dashing through the settings. Next time when you plan to install a new program, make sure you select “Custom” mode. It will display additional programs. Likewise, you will be able to remove the checkmarks from unwanted applications before they enter the device. 3. Find “Win Tuneup Pro” and select “Uninstall” function. 2. Find the “Win Tuneup Pro” in the list. ^ Michael Kassner. ​Are you being exploited by online marketers using "tricks for clicks"?. TechRepublic. News, Tips, and Advice for Technology Prodfessionals. ^ Mark Jones. Will 2016 be remembered as the year of the data breach?. Komando. Tech News, Tips, Security Alerts, Digital Trends. ^ Personal data protection: An intrinsic priority of Singapore's largest bank. e27. Connecting you to Asia's Startup Ecosystem. ^ Tara Seals. Consumers Hold Businesses, Not Themselves, Responsible for Data Breaches. InfoSecurity. Strategy, Insight, Technology. .
^ David Nield. 12 Security Tips To Stay Safe Online. Lifehacker. Tips and downloads to help you at work and play. This entry was posted on 2017-01-18 at 01:44 and is filed under System tools, Viruses. You can quickly scan the QR code with your mobile device and have Win Tuneup Pro manual removal instructions right in your pocket. How did you remove Win Tuneup Pro?